The panel is capable of 3.5 watts in the open sun with a peak power output around 6V at 615mA. Packaged solar cell with a 3.5mm x 1.1mm barrel plug and 5.5mm x 2.1mm adapter on a 22cm (8in) cable. 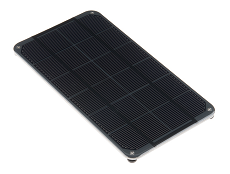 Each panel also features monocrystalline high efficiency cells at 19% with a waterproof urethane coating with hard-board backing. Robust sealing for outdoor applications!